Only a few know that balalaika and guitar form an ideal sound combination and 3 strings plus 6 strings are more than one arithmetic task – they form a new musical experience. 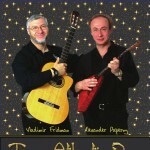 Now the three balalaika strings of Elbe and the six guitar strings of Potomac sound trans-Atlantic in the new duet of Alexander Paperny and Vladimir Fridman. Alexander Paperny (balalaika), educated as a soloist and conductor in Moscow. In 1986 he was a winner of a nationwide competition for ancient Russian folk instruments. From 1988 to 1998 Alexander performed in the Russian band Jazz-Balalaika, with which he toured all over the world and recorded numerous CDs. Later he moved to Germany and considerably extended his musical spectrum. Apart from the solo appearances, Alexander teamed up with partners playing the most different instruments such as piano, bajan, and guitar. He also built the trio Balalaika Nueva that won international prizes in Klingenthal (2003) and in Castelfidardo (2004). Alexander Paperny has recorded three CDs: A Piece of Sky, with Waldemar Gudi, Dreams of Balalaika, with various partners, and New Art for the People with the Balalaika Nueva trio. Guitarist Vladimir Fridman has worked in Moscow in several theatres, such as the world-famous Khudozhestvenny and Satyricon. In 1992, he joined Jazz-balalaika band where he met Alexander Paperny, with whom he also performed as a duo. He moved to the USA in 1998, where he pursued a solo career. Vladimir frequently performs solo and with leading musicians of Washington, DC at various venues, including the Kennedy Center. Since 1999, he has been playing with Gypsy Strings quartet and recorded the Ole Guapa CD with them. This CD won the 16th Annual Washington DC Area Music Award (WAMMIES) in the World Music Recording category. Vladimir also recorded two solo CDs: “Russian Romances”, a collection of his favourite Russian ballads and “Klezmer Reflections”, where he plays well-known Klezmer melodies, traditional Yiddish songs and a number of his own compositions. Vladimir teaches guitar in the Jewish Community Center of Greater Washington and also founded his own guitar studio. Many of his students regularly win awards in the Maryland State Guitar Competitions. The musical backgrounds of Alexander Paperny (which include traditional Russian, Classical and Latin-American music) and Vladimir Fridman (Jazz, Klezmer music) have converged in a new venture – the TransAtlantic Duo. That is why Alexander Paperny and Vladimir Fridman met in Washington D.C in 2004 to present this new concept for the first time in a series of concerts. Being successful, they decided to continue their concert activities. 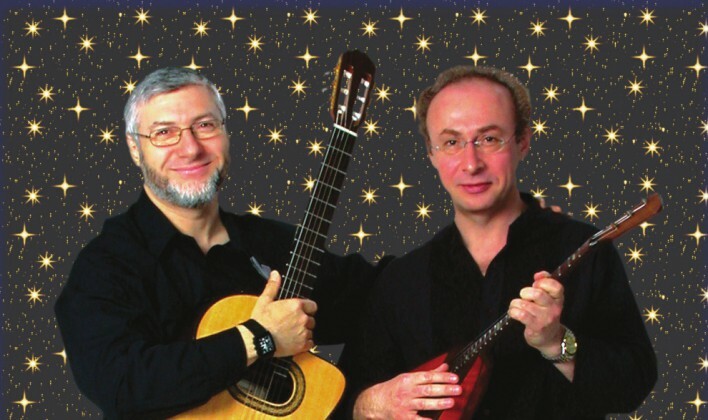 In 2007, the duo played a concert at the prestigious Kennedy Center in Washington D.C., and also appeared in a joined performance with the American Balalaika Symphony Orchestra. The music of TransAtlantic Duo unites vastly different musical styles: Russian, Jewish, traditional American, Jazz, Latino and even classical music. Alexander and Vladimir joined them in an inspired way to be more than simply the sum of its parts. The two masterful players, with their energized approach to music, produce their own distinctive sound experience. The convergence of guitar and balalaika of the TransAtlantic Duo is totally unique and exquisite. The Duo has absorbed many musical traditions and blended them with excellent style and marvellous virtuosity. The original arrangements of TransAtlantic Duo melted various musical styles into one colourful concert. The great virtuosity of Alexander and Vladimir transforms every piece they play into a sparkling and unrivalled experience. Ein Kommentar zur "TransAtlantic Duo"